During her tenure so far, U.S. Education Secretary Betsy DeVos has made it her mission to walk back regulations placed on the for-profit education industry. 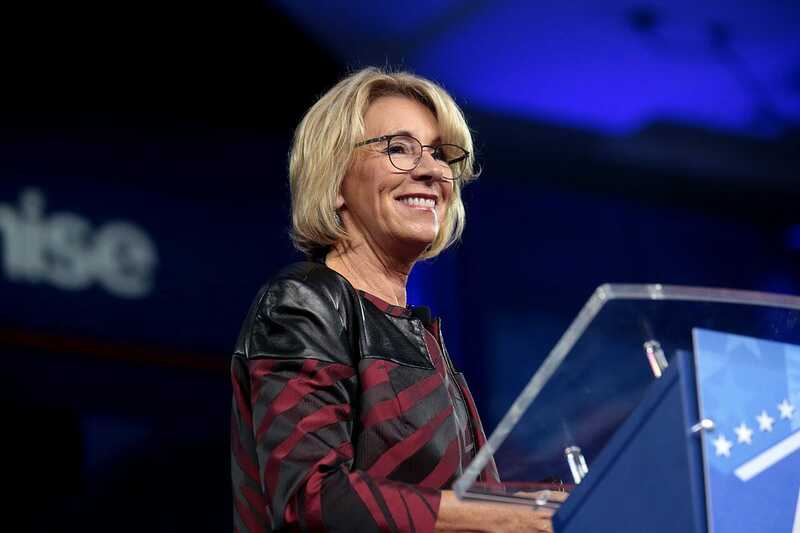 This week, it was revealed that she wants to take that mandate a step further by making it more difficult for students defrauded by online and in-person for-profits to forgive their federal debt. Politico obtained a draft of a proposal on Wednesday by the Department of Education proposal that would place a higher burden of proof on individuals seeking compensation from certain for-profit institutions who were found to practice illegal and predatory behavior against their students. If the proposal is enacted, it will play out in several different ways. To begin, it will still allow students whose alma mater misrepresented their graduates’ success or their institutions offerings to receive loan forgiveness. But the new proposal will not provide relief for students whose colleges breached their student contract. Students will also have half the time to claim loan forgiveness—three years to be exact, compared to the former six. In addition, DeVos wants to make it tougher for students to receive loan forgiveness by imposing a higher burden of proof on those defrauded. Under the former administration’s policy, students only needed to demonstrate a “preponderance of evidence.” The new proposal asks that students show “clear and convincing” proof of wrongdoing. Deputy Director of higher education policy at New America Clare McCann told Politico that “They’ve made it almost impossible for borrowers to meet the misrepresentation standard by requiring them to demonstrate the intent of the school especially when students don’t have the power of discovery.” Individual students, in other words, likely will not have the financial capabilities to hire the legal help to prove wrongdoing. The draft will be presented in a second round of negotiations next week. During former President Barack Obama’s tenure, his administration found that about 97% of students who enrolled in for-profits took out federal loans. Roughly half of those students would later default on that loan payment compared to 7% at non-profit private colleges and 11% at non-profit public universities. When this was discovered, regulators imposed heavy penalties on the most egregious perpetrators. Corinthian Colleges and ITT Technical Institute closed outright under the weight of severe penalties, while several others, including DeVry and Phoenix Universities, had to pay heavy fines. The former government also stipulated that institutions need to faithfully report their graduates’ professional success and provided an avenue for students who had attended the for-profit offenders to seek compensation. This last mandate is what Secretary DeVos now seeks to curb. She has already suspended the Obama-era policy mandating that institutions represent their graduate success rates. She has also appointed a former dean of DeVry University to head up her anti-fraud team. DeVry paid a $100 million settlement to the federal government in 2016 for defrauding their students. While for-profit deregulation seems by and large to be a project for DeVos, the head of her administration also has (or had) some skin in the game. While it was hardly the most widespread, Trump University might have been the most notorious and egregious for-profit “college.” The institution did not settle with the federal government because New York Attorney General Eric Schneiderman got to it first. In the end, Trump University was forced to pay $25 million in settlements.